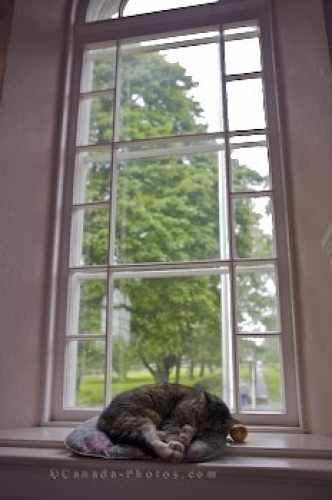 Life on the grounds at the Grand Pre National Historic Site in Nova Scotia, Canada is easy for this cat who resides here and spends many hours sleeping upon its pillow in the window of the Memorial Church. As the cat rests quietly, visitors to the Grand Pre National Historic Site explore the buildings and pass by this domestic cat. Church cat asleep in the Memorial Church, built in the 1920's, at the Grand Pre National Historic Site, Grand Pre, Minas Basin, Bay of Fundy, Nova Scotia, Canada. Picture of a cute cat in the window of the Memorial Church at the Grand Pre National Historic Site.